Springfield High school students and supporters gathered outside Smith & Wesson headquarters in Springfield on Wednesday. SPRINGFIELD — Less than a mile separates Springfield Central High School, where Hussein Abdi is a student, and Smith & Wesson’s sprawling headquarters on Roosevelt Street. “It’s literally down the street,” Abdi said. But it feels like a lot more. Abdi, 19, lives in one of the most dangerous parts of Springfield; Smith & Wesson, one of America’s largest gun manufacturers, is protected by guards and fences and barbed wire. Abdi spends his days worrying that he or someone he cares about will be shot to death; Smith & Wesson’s CEO, records show, lives in a relatively crime-free enclave about half an hour away. But on Wednesday, our remarkable and overdue national reckoning with gun violence brought Abdi and dozens of classmates, clergy, and activists to the gunmaker’s heavily guarded front door. At a 3 p.m. protest at the foot of a snowy war memorial across the street, students like Abdi demanded a meeting with the gunmaker, hopeful that a face-to-face discussion between those who profit from America’s gun culture and those who bear its steepest costs might make some sort of difference. 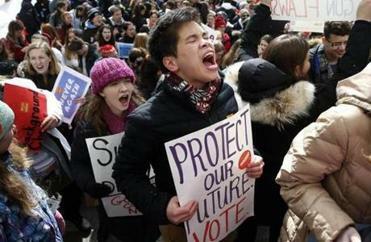 Massachusetts students had planned to walk out of school as part of a national protest but changed course after Tuesday’s snow led to school closures. Massachusetts is the safest state in the country when it comes to gun violence, but one of the largest manufacturers of firearms. Smith & Wesson makes several weapons, including the one used in the Parkland, Fla., shooting that spawned all this, a gun that can’t legally be sold in the state where it is made. And while mass shootings like the one in Parkland are too common, they are mercifully rare compared to criminal gun violence that claims the most lives. Now, those who have been living with much more prevalent forms of gun violence are hoping that America is ready to listen to them, too. “My child in Springfield is just as precious as a child in Parkland,” said Francena Brown, whose son was shot to death not far from here, on Page Boulevard, in 2006. His homicide remains unsolved. Until Wednesday, most of the advocacy around gun control had been aimed at government officials, said Bishop Doug Fisher of the Episcopal Diocese of Western Massachusetts, one of several area clergy who spoke at the rally Wednesday. But the federal government has been “so nonresponsive,” Fisher said. 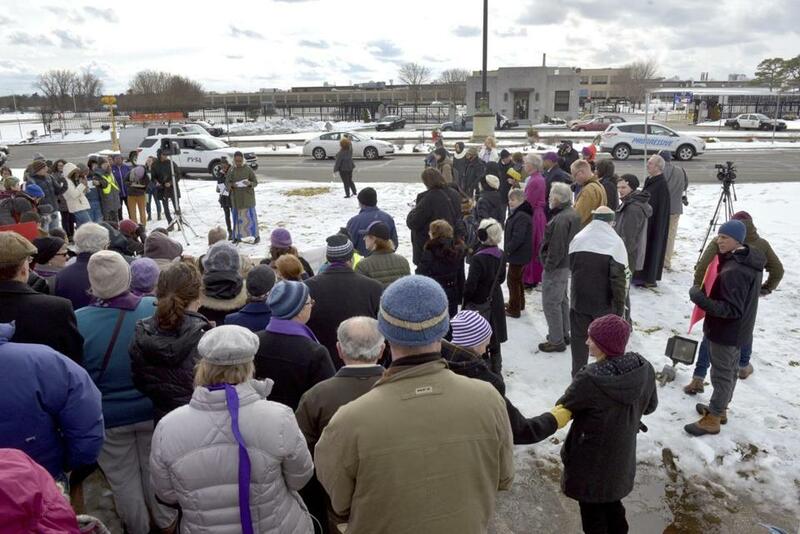 So Fisher and other Episcopal leaders from around the state, joined by students from Springfield, Holyoke, and Boston and supporters and activists from around the region brought their message to a constituency that has so far largely avoided the Parkland spotlight: America’s gunmakers. “We’re asking them to help create a solution,” said Brown, who has spent the years since her son’s death working with other survivors of gun violence and waiting for a moment like what has emerged in the last few weeks. Looking across the busy street and beyond at the Smith & Wesson facility, she said she couldn’t imagine anyone living her life and still going to work there. Seeing all that death and loss, “would trigger them,” she said. No representative from Smith & Wesson appeared to attend the rally. A small group delivered a list of demands to the guard shack outside, but it was unclear whether the message would make it to the company officers for whom it was intended. I sent an e-mail to Smith & Wesson’s media relations department but didn’t hear back. What might come out of that meeting? I’m not sure. In the roughest parts of a city like Springfield, solutions can be hard to see. Smith & Wesson has been part of Springfield for more than 150 years. But like it or not, it has become a part of America’s gun problem. It’s not too much to ask that the company’s leaders meet with some of the people bearing the cost of their business. And how hard could it be to meet with these kids? They’re right down the street.